Please note! The next round of classes begin this September 2019. To sign up for an Informational Session, click here. 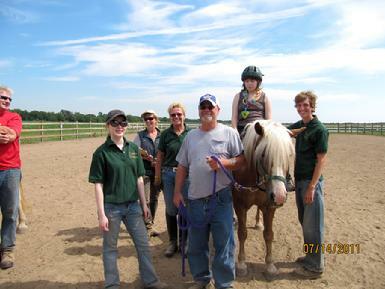 Plano Campus in the fall and spring semesters, coupled with hands-on experience gained at our partner facility, Equine Dreams Equine Assisted Therapy Center in Newark, IL in the late spring and summer months. of contributing positively to the physical, cognitive, emotional and social well being of individuals with special needs. and follow PATH curriculum to prepare students for success in the certification exam process. including such fields as barn manager, equine vet tech, trainer or assistant trainer, or horse care specialist, there are courses which will provide background knowledge and skills needed in these fields. "Each instructor made the class valuable and informative"
"Learned at lot of new ideas about teaching riding"
"Filled in holes in my horsemanship experience"
"Mix of theory and technical skills"
"Instructors were knowledgeable and always asked if we needed help with anything"
"Put the different learning styles together to accomplish the same goal"
Thank you to Dr. Megan Coveyou of Fox Valley Equine Practice for coming and speaking to our Waubonsee students on Equine Field Emergencies. It was a great presentation and we really appreciate you coming out. 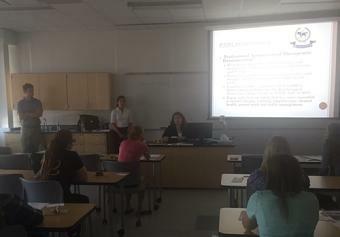 We will be having more presentations in the future so check back for future events! on passing her certification, and becoming a new PATH, International Registered Therapeutic Riding Instructor! !